Babylon 5 introduces the Shadow, one of the most mysterious and sinister villains in the genre, together with their deadly warcraft. Have we ever seen inside one of these terrifying vessels? An in canon description will suffice if there was none. Kinda yes, kinda no. It's important to understand that while the vessels used by the Vorlons and the Shadows extrude into realspace, the two races are in fact perfectly capable of assuming a non-corporeal aspect. It would appear likely that within the confines of their own ships, they don't take on physical form and it's certainly possible the the ships themselves aren't hollow. We do see inside a Shadow vessel (kinda) on at least one occasion, when Michael Garibaldi's ship is captured. As you can see, it's simply embedded into the ship itself which has flowed around him. If you're willing to look outside the TV show, yes. 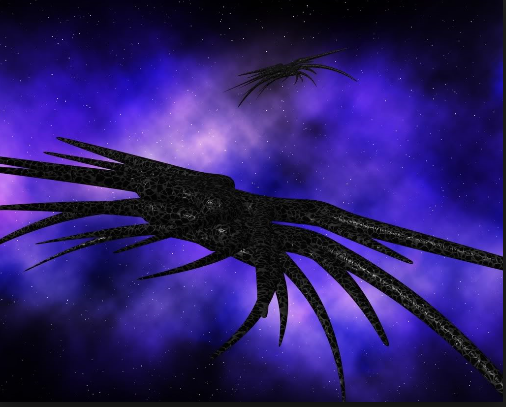 The inside of a Shadow ship is described in The Passing of the Techno-Mages trilogy. Honestly, there's not much to it. It is a more biological construct even though it's engineered, and the inside "skin" is the same appearance as the outside of the ship. There is only an outer dock/airlock area and an inner cabin. The cabin space is only one room and exists solely to house a vat of liquid that functions as the pilots chair. 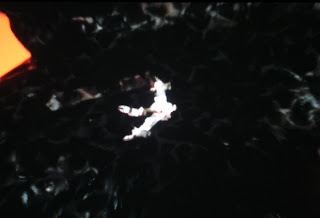 That liquid is what the cyborg pilots (like Anna) are lowered into, and it serves the dual purpose of connecting their wetware and thoughts to the rest of the ship systems and cushioning them against high-impact maneuvers. While acting as a shuttle (something that is resented, by the way), ships can push out their internal skin to create chairs, benches, minor accomodations like that. Presumably there's more to it, as even a massive biological construct would not consist entirely of black goop, but they don't get into how it's built or grown. In response to the comment discussion about whether actual Shadows ride-along, it's possible with the small cabin area, but seemingly not necessary. There is also the matter of acting as a cargo transport, both ferrying Anna's smaller transport and Garibaldi's fighter at different points. The entry to the inner cabin seems to be a kind of airlock system, one outer door, and one inner door, and that outer area in between is large enough for small ships to enter.